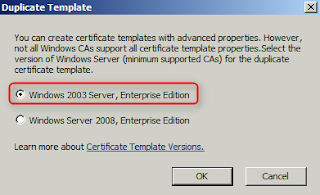 By default, Enterprise Administrator can duplicate all certificate templates. To delegate duplication of all certificate templates, we need to modify the settings of Active Directory. 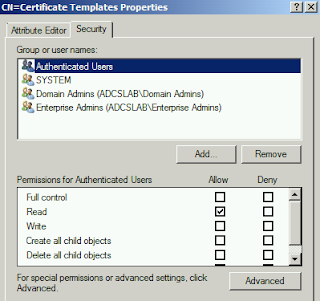 Assign right to Terry, which is a user of corp.adcslab.local, to manage all certificate templates. 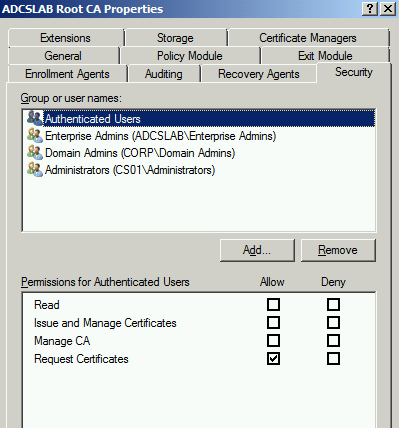 By default, Enterprise Admins, Domain Admins and local administrators group of AD CS server can manage "Certification Authority". Now, I will grant the permission for Terry, is a user of corp.adcslab.local, to manage CA. 1. On CS01, log in as corp.adcslab.local Administrator. 3. Right-click "ADCSLAB Root CA", select "Properties". 4. On "ADCSLAB Root CA Properties" window, select "Security" tab. 5. On "Security" tab, click "Add". 6. On "Select Users, Computers, or Groups" window, enter "Terry". 8. 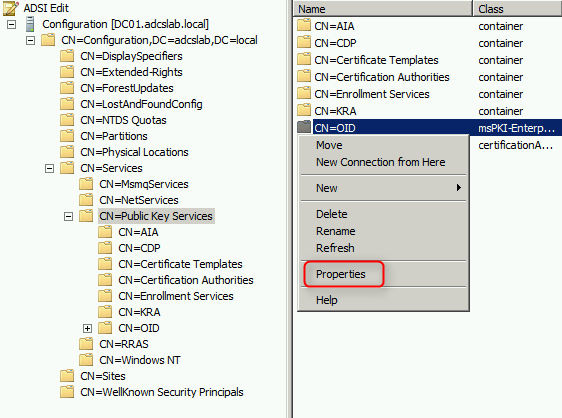 Next to "Permissions for Terry", check "Allow - Issue and Manage Certificates" and "Allow - Manage CA". Remark: In production environment, we should grant the permissions to a global or universal group that contains users for managing CA. 1. On CS01, log in as Terry. 3. 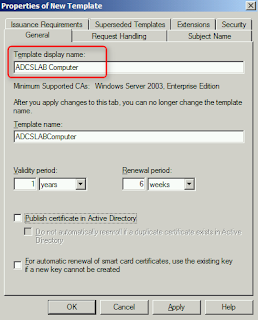 Expand "ADCSLAB Root CA > Certificate Templates". 4. On right pane, right-click "Basic EFS" and then select "Delete". 5. On "Disable certificate templates" window, click "Yes". 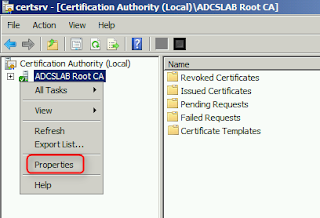 As a result, Terry can manage ADCSLAB Root CA. 1. 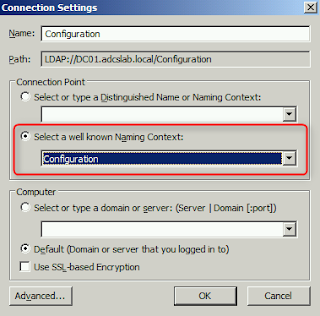 On DC01, log in as adcslab.local Administrator. 2. Click "Start", enter "adsiedit.msc" to launch "ADSI Edit". 4. 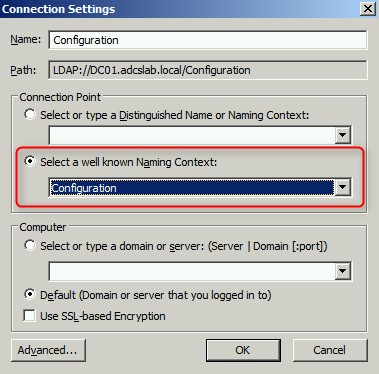 On "Connection Settings" window, next to "Select a well known Naming Context", select "Configuration". Remark: Make sure you connected to "Configuration" of Forest Root Domain. 6. 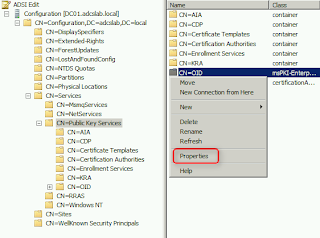 Expand "Configuration > CN=Configuration,DC=adcslab,DC=local > CN=Services > CN=Public Key Services". 7. 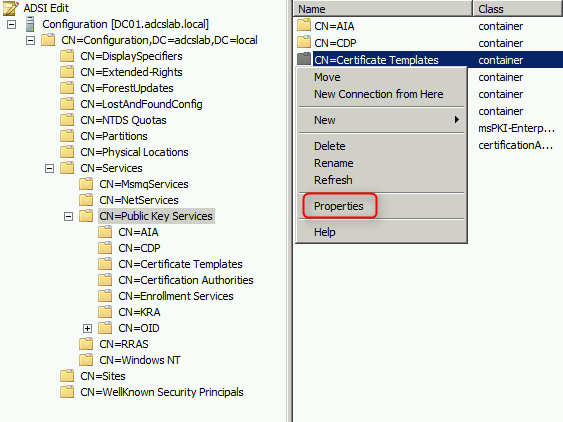 On central pane, right-click "CN=Certificate Templates", select "Properties". 8. 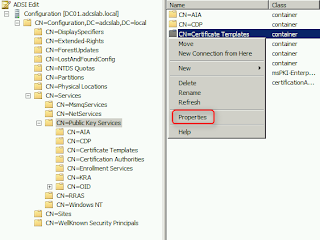 On "CN=Certificate Templates Properties" tab, click "Security" tab. 10. On "Select Users, Computers, or Groups" window, click "Locations". 11. 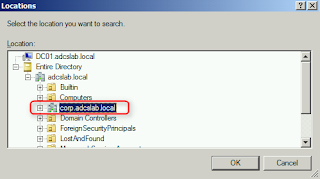 On "Locations" window, select "corp.adcslab.local". 13. Next to "Enter the object names to select (examples)", enter "Terry". 15. Next to "Permissions for Terry", check "Allow - Full control". 17. On central pane, right-click "CN=OID", select "Properties". 18. On "CN=OID Properties" tab, click "Security" tab. 20. 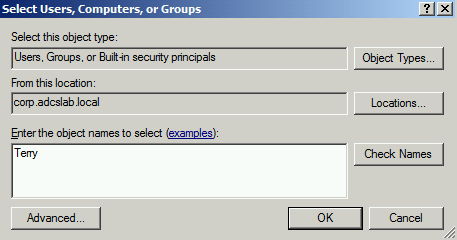 On "Select Users, Computers, or Groups" window, click "Locations". 21. On "Locations" window, select "corp.adcslab.local". 23. Next to "Enter the object names to select (examples)", enter "Terry" and then click "OK". 24. Next to "Permissions for Terry", check "Allow - Full control". Remark: In production environment, we should grant the permissions to a global or universal group that contains users for "Certificate Templates" and "OID". 2. Click "Start", enter "certtmpl.msc" to launch Certificate Templates Console. 3. On "Certificate Templates" console, right-click "Computer" and then select "Duplicate Template". 4. On "Duplicate Template" window, select "Windows 2003 Server, Enterprise Edition" and then click "OK". 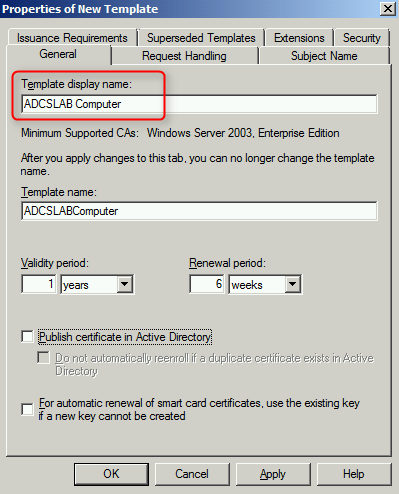 CORP.ADCSLAB.LOCAL administrator could not duplicate the certificate template because we haven't granted permission for CORP.ADCSLAB.LOCAL administrator. 6. Log off corp.adcslab.local Administrator. 9. On "Certificate Templates" console, right-click "Computer" and then select "Duplicate Template". 10. 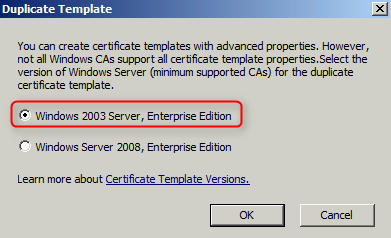 On "Duplicate Template" window, select "Windows 2003 Server, Enterprise Edition" and then click "OK". 11. On "General" tab of "Properties of New Template" window, next to "Template display name" and then enter "ADCSLAB Computer". As a result, Terry can duplicate the computer certificate template.